100% cotton hi-tech moisture removal, mini-waffle polo with knit 2dimensional contrast colour sleeve design and wide body panels arehighlighted with a fine piping. Also available with a matching kidscut. 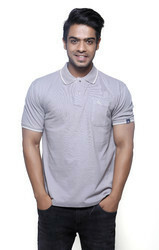 Our magnificent collection of mens polo t-shirts cast unique appearance in half sleeves which comfort the most in summers and is available in numerous colors.We deal in Foriegn queries only. We offer the best and unique innovative range of the Polo T-Shirt which is made of the finest quality of the fabric to provide elegance along with comfort. These can be worn in any season and on any occasion. The Polo T-Shirts are developed by using the matching thread to provide the descent look to the wearer. Our organization specializes in manufacturing, supplying and exporting Designer Polo T-Shirts. These t-shirts are available in various specifications, designs and colors. In addition, these t-shirts have smooth texture and are very comfortable to wear.